One day trip from Florence, biking in the Chianti Classico area. Pick-up: 9.00 a.m. Drop-off: 5.00 p.m. 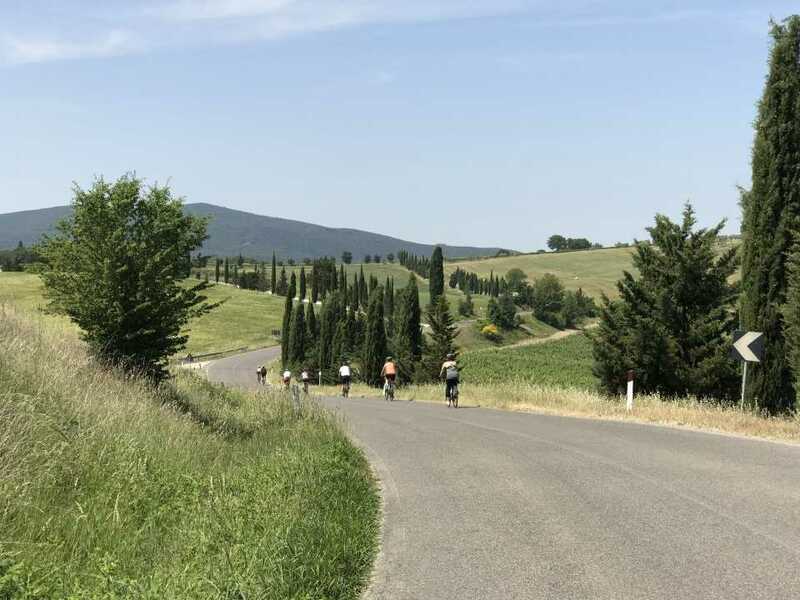 The Tuscany Wine Lovers bike tour will show you the colors and flavors of Tuscany. 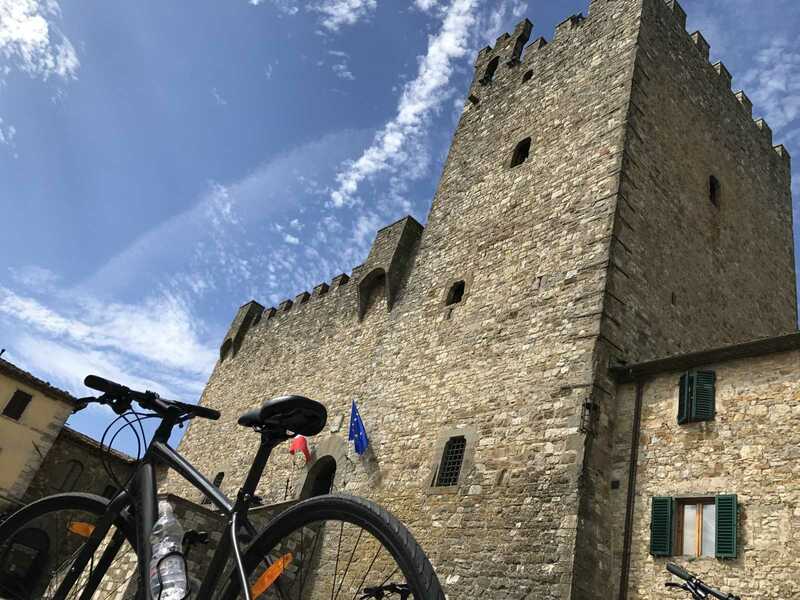 This extraordinary Tuscany bike tour, suitable for all levels, follows an itinerary which highlights small medieval towns, stunning landscapes, and three wine tastings. 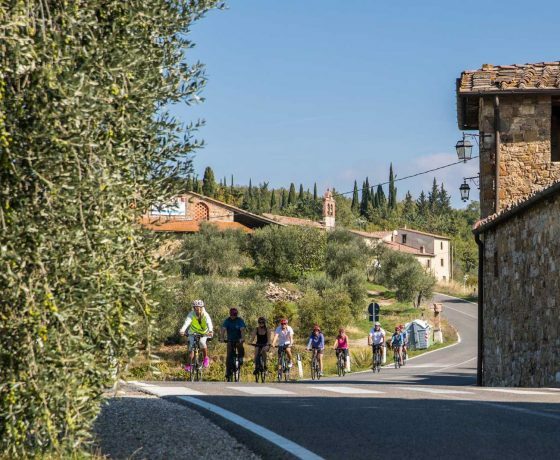 The Tuscany Wine Lovers bike tour starts with you being picked up and whisked off into the enchanting Chianti countryside. Visiting medieval towns you can stroll down the cobblestone streets, admire the tall lookout towers and do a bit of shopping. After the visits, we will fit you with one of our top-notch bikes so then you can begin to pedal your way through an itinerary stopping for several photo opportunities. 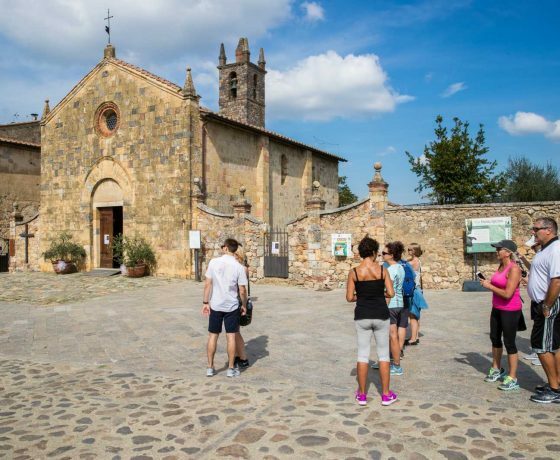 Town visits at some of the most panoramic points in Chianti: San Donato in Poggio, Castellina in Chianti, Fonterutoli, Monteriggioni. Estimated biking times is between 1.5 to 2 hours. 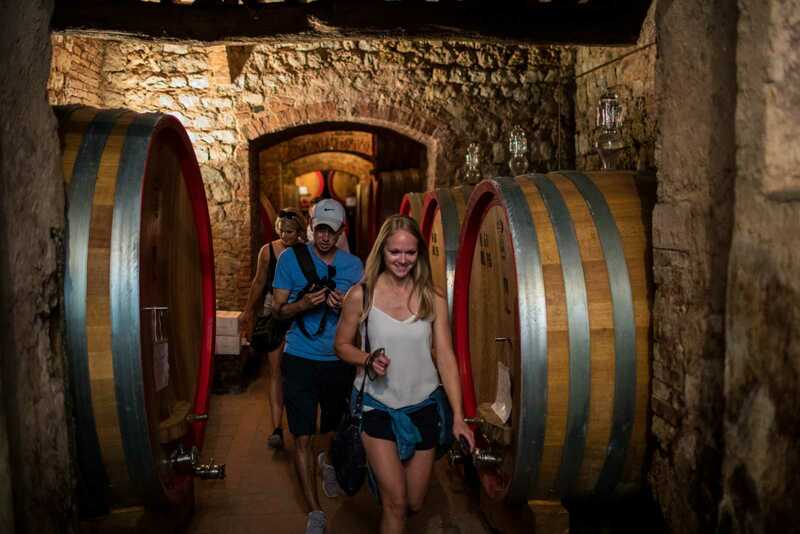 Tuscany Wine Lovers bike tour promises to satisfy your taste buds with our three exclusive wine tastings. Here you will experience the tingling tannin of the Sangiovese, the minerality of the Vernaccia and a few surprises. Each vineyard will show you a completely different aspect of Chianti, introducing you to its diversity and uniqueness. 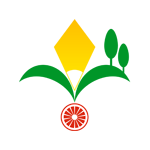 The first stop features not just typical Tuscan wines but also a few other regions in Italy. The support van will be with you the entire trip. 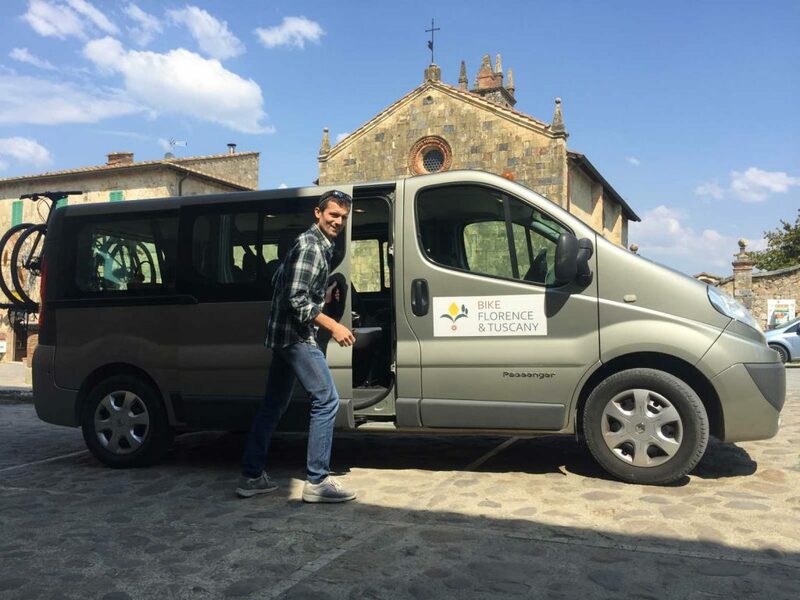 You can make purchases and store them in the van until the end of the Tuscany Wine Lovers bike tour. Back on the bikes to our next stop, cycling through the gorgeous Chianti countryside, where we will stop for a few more photos. The second stop includes a visit to their antique cantina, followed by four lovely wines and their delicious extra-virgin olive oil. The owners will guide you through tastings and explain how their wines express the soul and heart of their land and the people who work it. 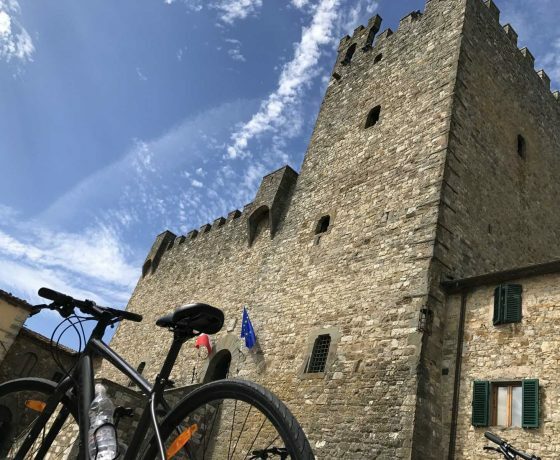 The tour ends with a visit to the charming walled village of Monteriggioni, an ancient medieval outpost founded to protect the Republic of Siena. 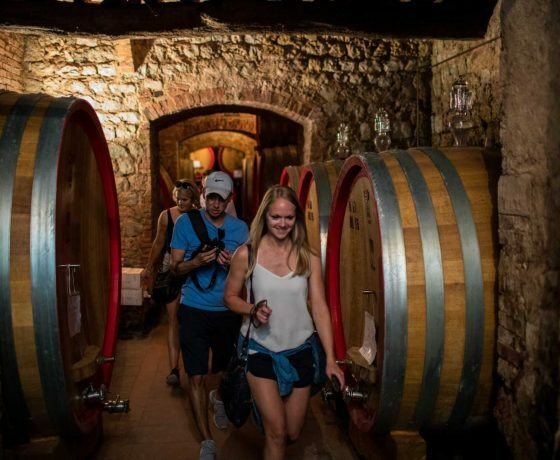 Surrounded by age-old olive groves and vineyards, we will enter within the town walls for your third wine experience with lunch. Pairing local organic products with Tuscan wines in the cantina of the local producer, you will experience the savory goodness of the area. For those who are concerned about not being in shape, or for those who haven’t saddled up on two wheels for a while we have an alternative so that they don’t have to sit on the sidelines for this beautiful experience. Ask us about our high-end Electric-bikes! Feel free to make your purchases during the ride: your touring will be fully van supported! Euro 155 per person for min. 2 people. High-quality light-frame disk brakes 27-speed hybrid bike, helmet, water bottle. E-bikes are available on demand. 1 Vineyard visit & tasting (Guided tour of the organic vineyards & historic cantina, wine & extra virgin olive oil tasting). Lunch & Wine experience (Wine education, wine tasting at organic farm pairing Tuscan wines & local food). All tasting fees and your Tuscan lunch are included. 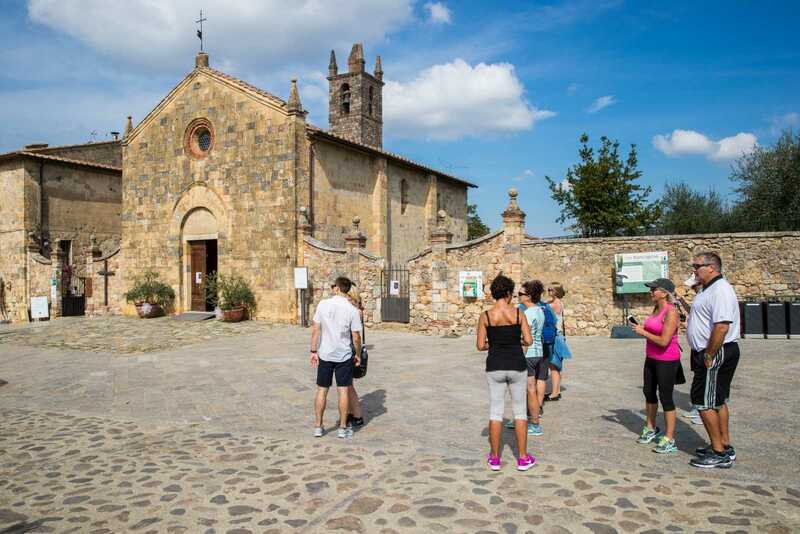 Starting point: Castellina in Chianti (SI). Distance traveled: 13 miles/21 Kms. (from Castellina in C. to Monteriggioni). My husband and I choose the Chianti bike tasting ride October 3rd 2017...I must say it was hard to choose, they all look so good! We were delighted to have Elena as our host and guide. She is BEYOND engaging, so informative and the best guide and expert on Tuscan towns and Italy. The day was gorgeous and the stops delightful. There were just the two of us on the ride and we felt so special. I would highly recommend that you use this company...Italians running an Italian company that are expert riders themselves. We will definitely ride with them next year, can't wait! Good food, good wine & all whilst cycling through the amazing scenery of Tuscany! 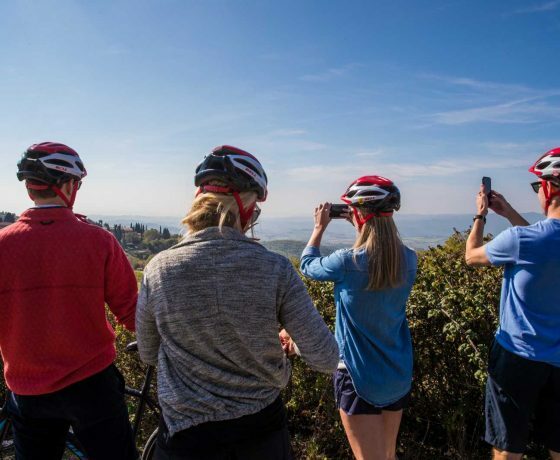 We were really looking forward to our ride out into the Tuscan hills having never been to the area and spending much of the later part of our trip in cities, and we were far from disappointed! Piero & Elena were warm & welcoming, kept in regular contact upto the day and ensured we knew exactly where we going and what we were doing on the morning of our ride. We got to see the wonderful countryside of the Chianti region, on a gentle September Sunday whilst drinking fabulous wine, eating wonderful local produce & meeting new people.......what more could you ask for? It was defiantly one of the highlights of our Italian adventure and would recommend it. One of the top highlights of our Tuscany trip! My husband and I are active and were looking for a more adventurous way to explore Tuscany. Bike Florence was the perfect fit to satisfy my hubby (a cyclist) and me a wino. It was the best of both worlds! 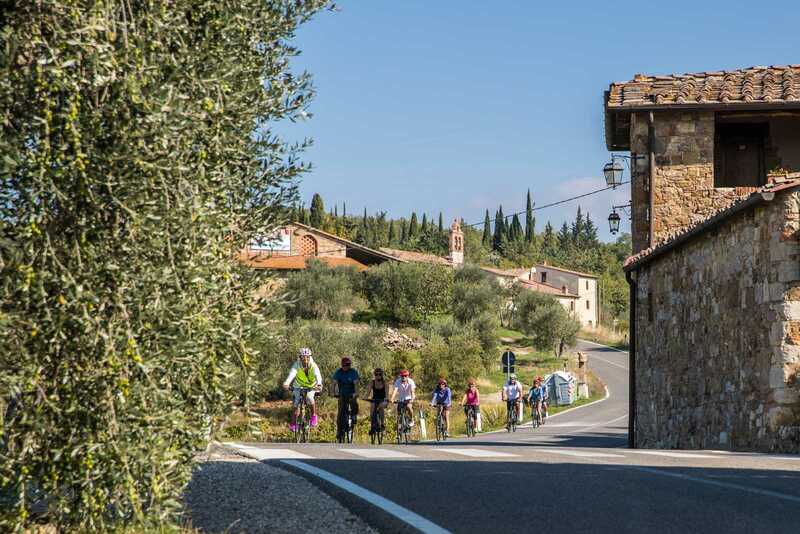 We selected the Chianti bike tasting and enjoyed a half day of wonderful cycling in the beautiful Tuscan hillside. I cannot say enough about Piero and Eleana and their wonderful hospitality. From booking the tour to helping with directions and selecting excellent wineries, we felt extremely taken care of. Both were gracious, witty and focused on safety. We had an amazing experience that we'll treasure for a long time to come. 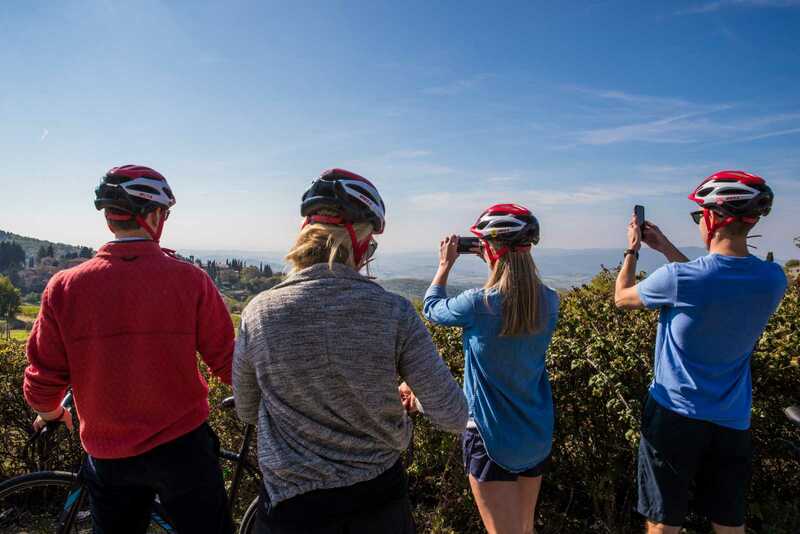 If you're looking to explore Tuscany on bike, you simply can't go wrong with Bike Florence! Thanks again Piero and Elena for taking such good care of us. We'll spread the word about our great experience to all our Texas friends! Grazie mille!